everett.peacock.com: Review of "The Parrot Talks in Chocolate"
I downloaded The Parrot Talks in Chocolate (The Life and Times of a Hawaiian Tiki Bar) to my Kindle when it was offered for $0.99, after reading rave reviews on the May 2011 Informal Poll. I'm so glad that I was referred to this book. 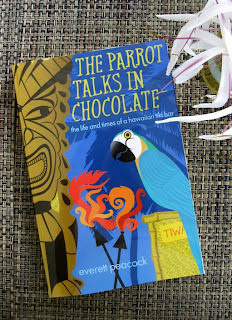 It is uplifting and inspiring--with vivid descriptions of life, adventure, and romance on the beautiful island of Maui. The book is a fast read. I finished it in 3 days, mostly a chapter or two a night before going to sleep. After putting the book down each night, I would start visualizing moving from my Arizona home to live on one of the Hawaiian islands. I may just do that sometime. Hawaii is one of my all time favorite places.